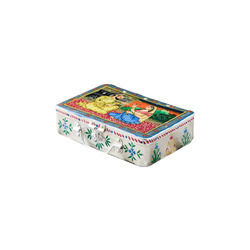 Fine decorative bone Painted box available in different designs & sizes. Minimum Order Quantity - 1 container (Mixed products or single product) as per client's requirement. 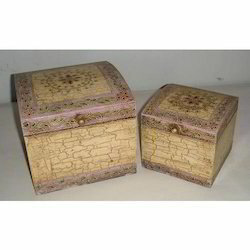 Papier Mache Hand Painted Moghal Jewelry Box. Magnificently hand painted, this jewelry box is a true piece of art. Leveraging on our extensive market knowledge, we are providing a high quality range of Painted Box. Tissue box made in wood and hand painted on the sides. Let this beautifully hand painted tissue holder add colour to the white paper tissues you use everyday. Wooden Multicolored Hand Painted Box with Elephant Leg illustrates superior carvings, and amazing color combination. This Beautiful piece of art is made of high quality wood. The colorful box has elephant’s face and legs as pillars on all four sides to support the box. Hand Painted Wooden Jewelry boxes. These can be customized as per customer's requirement. Available in various designs and colors. As per the varying requisites of our customers, we are engrossed in bringing forth a world class consignment of Speaker Box Paint. Widely acclaimed owing to their reliability, these are massively accepted. Also, these are offered at most reasonable rates.